Most adult cortical dynamics are dominated by a minority of highly active neurons distributed within a silent neuronal mass. If cortical spikes are sparse, spiking of single distinct neurons, such as hub neurons (Bonifazi et al. 2009), can impact on network dynamics and drive an animal’s behavior. It is thus essential to understand whether this active and powerful minority is predetermined and if true to uncover the rules by which it is set during development. Current work in the lab aims at testing the possibility that birthdate is a critical determinant of neuronal network function into adulthood, in health and disease. More specifically, we reason that neurons that are born the earliest are primed to participate into adult network dynamics. 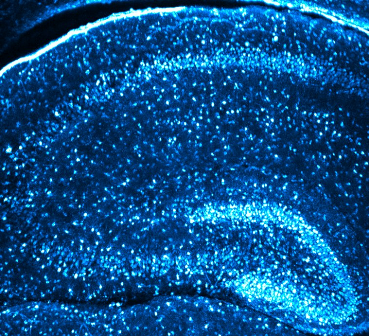 This hypothesis is considerably fed by our past work aiming at understanding how cortical networks function and assemble during development. To test this hypothesis, and more generally to describe structure-function relationships in cortical networks, we have developed a multidisciplinary approach that combines in vitro and in vivo calcium imaging and electrophysiology, neuroanatomy, notably from clarified intact structures, mathematical analysis and mouse genetics. Understand the role of early born neurons in cortical network activity during development and into adulthood, in health and disease. Dissect the connectome and the functional topography of early-born cortical neurons. Awake hippocampal reactivations project onto orthogonal neuronal assemblies. Development of early-born γ-Aminobutyric acid hub neurons in mouse hippocampus from embryogenesis to adulthood. Internally Recurring Hippocampal Sequences as a Population Template of Spatiotemporal Information. Operational hub cells: a morpho-physiologically diverse class of GABAergic neurons united by a common function. Dissecting functional connectivity of neuronal microcircuits: experimental and theoretical insights.